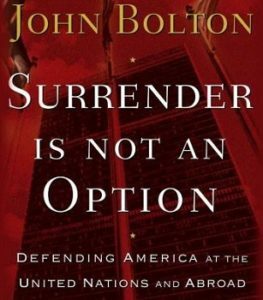 The hawkish John Bolton – for bombing Iran and North Korea – has been announced as HR McMaster’s replacement for National Security Adviser, a post which requires no Senate confirmation. He was for the Iraq attack on Saddam Hussein and still thinks it was a good idea. He is a frequent Fox News commentator who has impressed Trump with his appearances; though he differs on Putin whom he distrusts and on free trade. Known for his intelligence, stubborn ideology, rudeness, arrogance and contempt for those who questions his views, he has been described as “stunningly impolitic”. Born 20 November 1948, he has an intense late Scorpio Sun with Mercury also in Scorpio square Pluto, which will give him a forceful way of arguing. He’s also got a volatile, overly-excitable Mars in outspoken Sagittarius opposition Uranus. This latter sits on top of Trump’s Sun opposition Moon, so he’ll either irritate Trump or provoke him into wild decisions and actions. 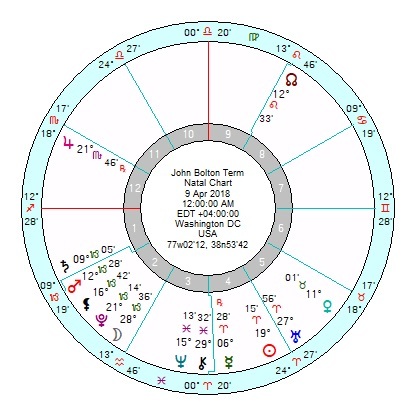 Their relationship chart (without one birth time) is friendly with a composite Sun Venus Mercury; though there is also an unstable composite Uranus which is inconjunct Jupiter and trine Mars. Bolton’s chart is looking surprisingly stressed and undermined this year for a man who has just been handed a prized job. He’s got Solar Arc Mars opposition his Saturn around now which is usually a major setback; a panicky-failure Solar Arc Neptune conjunct Mars and a totally deadlocked Solar Arc Saturn square Pluto. Plus a couple of undermining Neptune transits to midpoints till early 2019; and stuck/infuriated tr Pluto square Mars/Pluto 2018/2019. 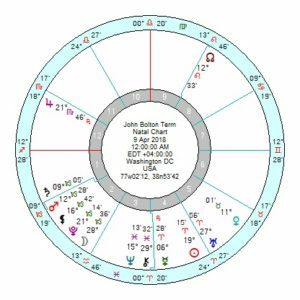 He takes over on 9th April, assuming 12 am, which is a very aggravated chart with Mars Saturn conjunct; with Sun square Mars and Pluto and Uranus square Pluto (and Moon). Not a trip he’ll enjoy. Just a reminder from a previous post – Trump’s relationship charts with both Republican charts, 22 Feb 1856 and 28 Feb 1854, are moving into rocky territory. 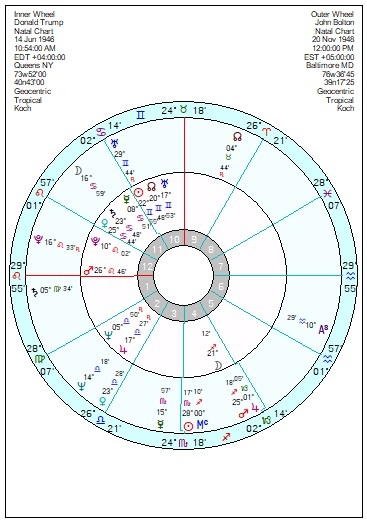 On the 1856 one – really from now, but peaking from April 11th to late month, and repeating early 2019 with tr Uranus in a disruptive conjunction to the composite Sun and then Mercury. 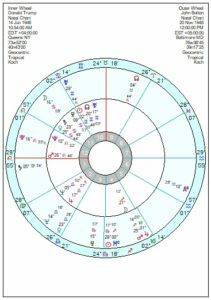 On the 1854 – tr Uranus conjunct the Sun this July and trine Mars, repeating Sept/Oct and early next year, so much the same. Pic of John Bolton by Michael Vadon. Rectified horoscope, without known birthtime. After a 2016 of just 1.9 percent GDP growth, we are now at four. Supreme Court Justice Neil Gorsuch,the perfect replacement for Justice Antonin Scalia. Trump managed to get China to help rein in North Korea. And of course, the wall is being built. Please take these monologues offline, Deborah. I’d be interested since I’m not well enough up on the detail of all the above to have another view on the facts. The economic factors can be discounted since economic policies have a two year time lag and he’s only been in for less than fifteen months. Walls – as History demonstrates – are ephemeral things. Particularly when Pluto is in Capricorn. When Pluto is in Capricorn it is not a good time to build walls. End of. Marjorie, Everyone was SO upset that Trump did not veto the Omnibus Bill. The Bill was too long for anyone to read through it but Trump has been handling contracts his entire adult life. And . . . he told us he would always fight for us, and never let us down. All it took was several carefully crafted lines, in a part that talks about military spending and national defense. Anyone reading through that part would probably miss that a few words had been added. Do it in a committee meeting, with a voice vote, and then push it back into the mass of the Bill, ready for a vote on the floor. Our President understands contracts, and understands how congress works. He watched (we all did) Obama push thru bills too big for anyone to read. Remember Pelosi saying about Obamacare “we have to pass it to know what’s in it”? His tweet this morning: (“Because of the $700 & $716 Billion Dollars gotten to rebuild our Military, many jobs are created and our Military is again rich. Building a great Border Wall, with drugs (poison) and enemy combatants pouring into our Country, is all about National Defense. Build WALL through M!”) And yesterday, before the bill was signed, Q made a drop about Red Castle which is the Army Corps of Engineers logo whiich will be utilized to construct it. You are so delusional there’s no point even bothering. “He’s had the most successful first year of any President.” Somewhere Barack Obama and FDR’s ghost are rolling on the ground laughing. Marjorie, DJT is not close to a psychiatric breakdown, good grief. Did you notice though, he is building the wall? He fooled everyone, the man truly is a very stable genius. 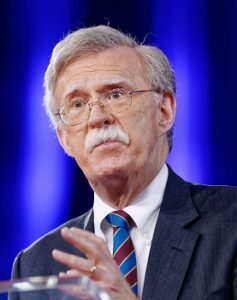 I read that Trump didn’t want to hire Bolton because of his mustache, it seems like he only has people there for the sake of appearances. I saw an interview with Trump asking about government job vacancies, ” I’m the only one that matters, the only one that matters is me,” his presidency is a one man show. Just to cheer you up. USA media obviously moving into hyper-panic zone. The dehumanization of trans-gendered soldiers is yet another of his attacks on those perceivd as “weak”. The same scenario was applied toward black soldiers pre-WW1 – being seen as mentally and physically inferior to white soldiers. Dear god, please end this madness soon. The way people have been coming and going in Trump’s “administration” lately, I doubt John “The Hawk” Bolton will last very long. Bolton will probably say or do something that will get him the “axe” in a few weeks. Honestly, I’ve met people who lived through the Richard Nixon Era who said they witnessed less political chaos and corruption. Thank G-d we have the midterm elections to look forward to. Bolton’s super PAC collaborated with Cambridge Analytica. Maybe Bolton will get drawn into that investigation. Honestly, there seems to be no bottom to this corruption.